Fig 1: The dusty galaxy NGC 253. Image curtesy apod.nasa.gov. The Galaxy NGC 253 (shown in Fig. 1), also known as Sculptor galaxy, is located in the very south of the night sky. While looking just like any other intermediate spiral galaxy, several aspects make it one of the more interesting galaxies in the adventure of unraveling the sources of cosmic rays. With a distance of only 3.5 Mpc, it is one of the closest neighbouring galaxies beyond the Local Group, which allowed Caroline Herschel to detect it already in 1783. More importantly, NGC 253 is undergoing a phase of greatly enhanced star-formation at its centre: a phenomenon called a starburst episode. A higher birth rate of new stars is always accompanied by a similarly increased rate of supernova explosions, whose remnants (SNR) are suspected to be one of the prime candidates for the acceleration sites of Galactic cosmic-rays. Despite more than 100 years of intense research, the astrophysical sources of Galactic cosmic rays are still not firmly established. If we adopt the aforementioned paradigm, observations of NGC 253 are averaging over a whole population of SNRs providing an independent test-bed for the SNR cosmic-ray acceleration hypothesis. Together with M 82, NGC 253 is the only other galaxy exhibiting such a starburst episode while being close enough to allow for the detection of gamma rays with energies from 100 MeV to a few TeV. Currently, these two galaxies alone make up the individual gamma-ray source class of starburst galaxies, which are the faintest TeV gamma-ray emitting sources known. To follow the starburst premise, a few assumptions have to be made. Gamma-ray emission from distant galaxies is not a rare finding. In most cases, however, this originates from the activity of the galaxy's central super massive black hole (with masses ~109 solar masses), and not from the starburst region. Whether there was such a recent active phase of the central black hole of NGC 253 continues to be debated in the literature. The long-term monitoring of the high-energy gamma rays, however, doesn't reveal any significant variability of this source since 2008, an observation compatible with the gamma-ray emission being starburst in origin. The H.E.S.S. telescopes performed observations towards NGC 253 already in 2005 and in the years from 2007 to 2009, yielding a detection in 2009  which was awarded with a source of the month article and a publication in the prestigious Science journal. Still today, NGC 253 is the faintest gamma-ray source ever detected, with around 0.3% of the Crab Nebula's flux. Such a faint source with an incredibly low gamma-ray rate of less than 2 gammas per hour integrated over long exposures is a challenge on its own. The spectral analysis has been presented in 2012  with limited precision due to at the time not fully understood instrument systematics, leading to an uncertainty on the flux level of around 50%. With time comes wisdom: More detailed understanding of aspects like the exact position of the cameras of the H.E.S.S. telescopes with respect to the mirror dishes have allowed for a significant reduction in the systematic uncertainty level, revealing that the overall flux value lies approximately 40% higher than quoted in 2012, with a mildly softer spectral slope than previously indicated (see red data points in Fig. 2). What are the implications of these changes with respect to the paradigm that this gamma-ray emission originates predominantly from protons interacting with gas in the starburst? Models which evaluate this question predict quite hard spectral indices. To address this question more adequately, a more complete gamma-ray picture is needed. Additional input to this picture is provided by Fermi-LAT gamma-ray satellite observations. Although this information was also available previously, considerably less Fermi-LAT data was available. More than four years later, the data set has not only doubled, but the advances in the reconstruction and analysis techniques allow for a more precise view on the gamma-ray output of NGC 253 in the 100 MeV to 100 GeV energy range (see blue data points in Fig. 2). Interestingly, the Fermi-LAT data starts to indicate a deviation from a power-law behaviour at low energies, which would be expected in the hadronic-origin paradigm (see grey model bands in Fig. 2). Fig 2: The updated H.E.S.S. 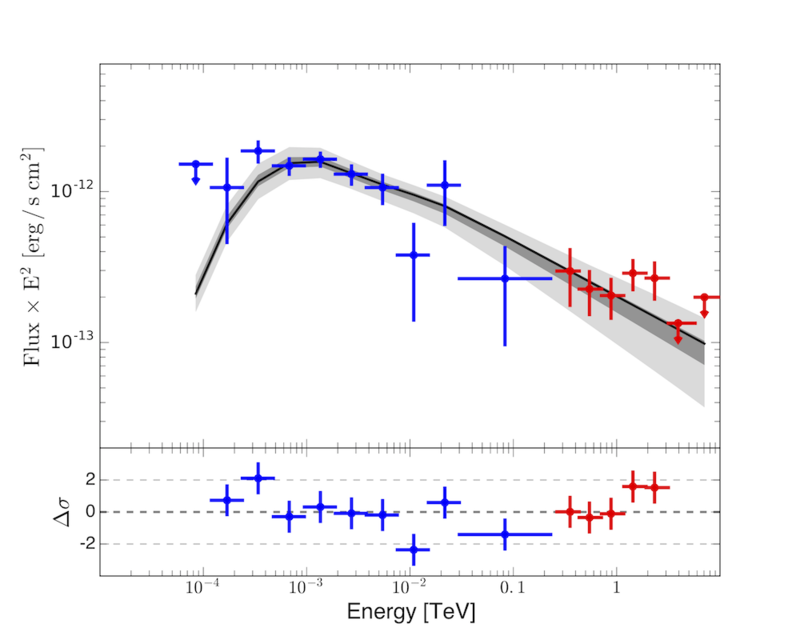 measurement (in red) and the updated Fermi-LAT analysis (in blue)  . How thick is the gas in NGC 253? The gas density within the central starburst nucleus of NGC 253 is much higher than in the rest of the galaxy. Cosmic rays in this region thus undergo collisions with this gas very efficiently and produce gamma rays. One can then ask what fraction of the cosmic rays produced in supernova remnants interact, and what fraction actually escapes this region following their propagation through it? The gamma-ray measurement (shown in Fig. 2) presents a useful proxy for this. If all cosmic-rays that are born in the starburst nucleus die in it, the gamma-ray spectrum should have the same slope as the cosmic rays in NGC 253. If, however, a fraction can escape the nucleus (e.g. with the help of the wind created by the starburst), then higher-energy cosmic rays are more likely to interact with gas than lower energy cosmic rays. A model which takes this effect into account is shown in Fig. 2 (grey band). As all such calculations are highly uncertain due to astrophysical assumptions of e.g. the cosmic-ray acceleration efficiency, only an order of magnitude estimate is possible. Despite this limitation, the fraction of cosmic rays that interact with the gas can be probed with the gamma-ray measurement. The H.E.S.S. and Fermi-LAT measurements show that this fraction is 10%-100%, meaning that at least 10% of the cosmic rays accelerated by the numerous supernova remnants die inside the starburst nucleus and do not escape in the starburst wind. H. Abdalla et al. (H.E.S.S. Collaboration), "Hadronic gamma-ray emission from the starburst galaxy NGC 253 seen by H.E.S.S. and Fermi-LAT", in preparation.